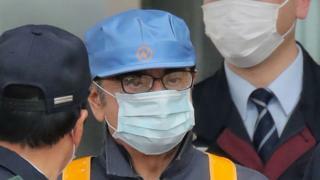 A lawyer for former Nissan chairman Carlos Ghosn has apologised for disguising his client in a workman's outfit to leave Japanese detention. Takashi Takano said his "amateur plan" had backfired. Mr Ghosn was widely identified and photographed as he left prison on bail on Wednesday. Afterwards, the getup - overalls, a cap and a face mask - was derided on Japanese TV and online. Mr Ghosn is charged with financial misconduct and breach of trust. "The disguise was all planned and carried out by me," Mr Takano said in a blog post on Friday. "I feel sorry about that.. due to my amateur plan, the fame he has built over a lifetime was tainted." Mr Takano wrote that his goal had been to stop journalists from locating Mr Ghosn's residence, saying that if they had, "not only would he not be able to have his life back, but also his health would be damaged". "The life of his family and his neighbours would be threatened," he added. Mr Ghosn, who led Nissan for two decades and was a towering figure in the automotive industry, has been in detention since 19 November last year. Mr Ghosn, 64, was seen getting into a van and was followed by reporters - who it appears did not track down his home's exact location. His disguise was roundly mocked by the media, with one Japanese TV station even re-enacting the incident complete with a man in a lookalike outfit, and a similar van to the one Mr Ghosn used. Though he was released after posting bail of 1bn yen (£6.8m; $8.9m), Mr Ghosn but must adhere to strict bail conditions. He will not be able to access the internet, and his computer access is restricted to his lawyer's office during weekday daytime hours. He must stay at a residence in Tokyo designated by the court, and will be under constant video surveillance. Any violations of these restrictions could send him back to jail. Mr Ghosn's release comes after Japanese courts had rejected two previous requests for bail, saying the Brazilian-born executive posed a flight risk and could conceal evidence. He faces three charges in Japan of financial misconduct, including understating his income and aggravated breach of trust. He has said his arrest was the result of a "plot and treason" against him - a bid by some Nissan executives wanting to stop his plan to integrate Renault, Nissan and Mitsubishi. The case has attracted global attention and drawn criticism of Japan's criminal justice system, which allows for lengthy detention periods.